Iranian, Turkish and Azeri Foreign Ministers, Javad Zarif, Ahmet Davutoglu and Elmar Mammadyarov respectively, held the third annual trilateral meeting foreign ministers today in the Turkish city of Van. 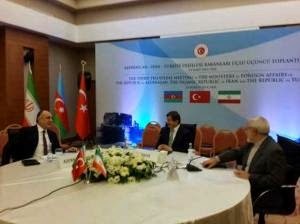 The trilateral meetings, first started in 2011, deal with energy, trade and transportation issues among the countries. Davutoglu opened the meeting by saying that the borders among the three countries should be friendly and brotherly boundaries. But no breakthrough on any substantial issue was reported during the meeting today. The disgraceful anti-Iran regime is preparing Azarbaijan for an gradual Pan-Turkist takeover and "union" with Baku republic.